This is the Northwest Minnesota Birding Report for Thursday, June 24, 2010 sponsored by the Detroit Lakes Regional Chamber of Commerce. You may also hear this report by calling (218)847-5743 or 1-800-433-1888. Wet weather still prevails in the northwest, and since one can't do yard work, we might as well be birding! Now is the time to observe nesting behavior and to find nests. Baby birds seem to be everywhere making birding by ear a challenge with their bird baby talk and all the meadows are bright with summer wildflowers this week. Craig Mandel reported on the MBW trip to the northwest on June 18 to June 21. In Lake of the Woods County, the group observed LEAST BITTERN along the Roosevelt Road at the Roseau County line, WHIP-POOR-WILLS were heard along the Pitt Grade and the Roosevelt Road. Other species seen included 17 species of warblers including 3 CONNECTICUT WARBLERS along the Pitt Grade, BLACK-BILLED CUCKOO, WESTERN KINGBIRD at Morris Point, BLUE-HEADED VIREO, and BOREAL CHICKADEE along the Faunce Road two miles north of Faunce. In Roseau County, Craig's group heard WHIP-POOR-WILLS along the Roosevelt Road, and also saw MAGNOLIA WARBLER and LINCOLN'S SPARROW. Sandy Aubol reported 2 BLACK-BILLED MAGPIES about 3 miles south of Roseau along MN 89 on June 22. Beltrami County sightings by the group, most seen at Big Bog SNA, included OLIVE-SIDED FLYCATCHER, BOREAL CHICKADEE, NORTHERN PARULA, MAGNOLIA WARBLER, PALM WARBLER, CONNECTICUT WARBLER, and LINCOLN'S SPARROW. Sandy Aubol saw a TURKEY VULTURE along MN 32 in Marshall County near the border with Pennington County on June 22. At Agassiz NWR, Maggie Anderson reported that 5 TRUMPETER SWAN cygnets were seen at the Tamarack Pool banding site on June 17. On June 24 a COMMON LOON was seen from the auto tour route at Headquarters Pool . A BLACK-BILLED CUCKOO was seen along Westgate Road today. In Red Lake County on a BBS, Shelley Steva found COMMON RAVENS, 3 BLACK-BILLED CUCKOOS, and an INDIGO BUNTING. Steve Dahl saw a TURKEY VULTURE along US 59 on June 21. Sandy Aubol found two GREAT EGRETS along CR 19 in Polk County about 2.5 miles east of East Grand Forks on June 18. Scott Kahan in Becker County reported a pair of RED-NECKED GREBES on both Homstad and Hesby Lakes at Hamden NWR this week. Other species seen included REDHEAD, RUDDY DUCK, GADWALL, and AMERICAN WIDGEON. He reported a nesting pair of TRUMPETER SWANS on Lethenstrum WPA near Hamden Slough NWR. Marshall Howe reported a female COMMON MERGANSER on Little Sand Lake in Hubbard County near Park Rapids on June 16. Thanks to Craig Mandel, Maggie Anderson, Marshall Howe, Sandy Aubol, Scott Kahan, Shelley Steva, and Steve Dahl for their reports. Please report bird sightings to Jeanie Joppru by email, no later than Thursday each week, at [email protected] OR call the Detroit Lakes Chamber's toll free number: 1-800-542-3992. Detroit Lakes area birders please call 847-9202. Please include the county where the sighting took place. The next scheduled update of this report is Thursday, July 1, 2010. 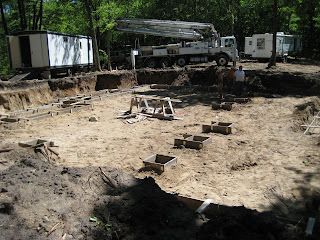 We hope our many resort friends are enjoying the lake home building project updates. The builders are really moving…but we’ll trying to keep getting some recent photos on the web. Just a reminder that we are taking advanced reservations for 2011. Thank you Dana of Detroit Lakes, MN for this beautiful painting of everyone’s beloved resort mascot…Nacho! He has been forever immortalized on a rock. Now…see if you can find it on your next vacation to East Silent Resort! We thought our East Silent Resort friends would enjoy these recent pictures of the new lake home construction. 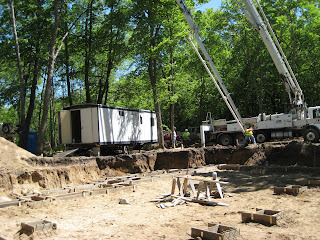 Framing will begin later this week and both units will be ready for rent by spring 2011. We have already begun taking reservations so don’t miss out on an opportunity to secure a week for your family. Additional information can be found on our website under lake homes. Or, call us at 800-242-6904 to learn more! Herb Knoke of Minneapolis caught this gorgeous 26 inch 7 pound walleye in East Silent Lake the past Friday evening. It took nearly 25 minutes to reel in…but after this quick photo he released it back into the lake. We still have a few mid-summer weeks available so don’t miss your opportunity to catch it! Or…already thinking about fall? We have some great off-peak specials. Already thinking about the perfect family vacation destination for 2011? As our existing guests recently learned…we are in the process of building two new units at East Silent Resort. The new lake homes will be on the east side of the resort (beyond Cabin 10) and offer fantastic views and lake access with a private dock. Each lake home has 3 bedrooms and 3 bathrooms. However, these lake homes were designed as “lock-out” units so smaller groups are welcome to rent just a portion of the unit. Together, these units can sleep up to 20 people…making them perfect for your families upcoming family reunion. We’ll be including more photos and renderings in the coming weeks and months. In the mean time, learn more about the new East Silent Resort Lake Homes at http://www.eastsilentresort.com/cabins/lakehomes.html.